Air Pumps for Fish Tanks – 3 reasons why you need them for your goldfish tanks | My Goldfish Is Alive! 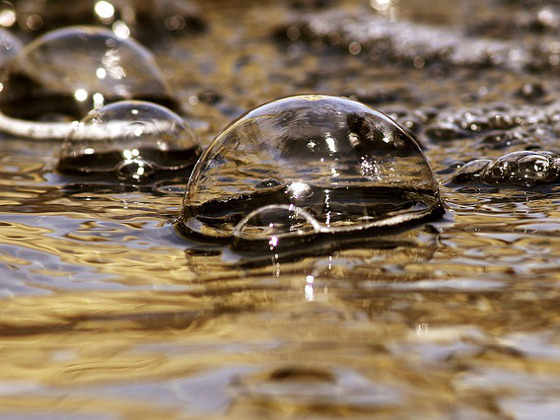 Air bubbles have always been associated with fish keeping. Don’t believe me? Well, try googling for kid’s drawings of a fish tank and you will get the idea. In a fish tank environment, air bubbles do not get created by themselves. They are produced by this equipment called the air pump. Air pumps for fish tanks are really common and can be found at any fish stores. They are also relatively cheap too! Let’s take a look at what an air pump is, how does it work and why you need them in your goldfish tank. The picture above is an example of an air pump. 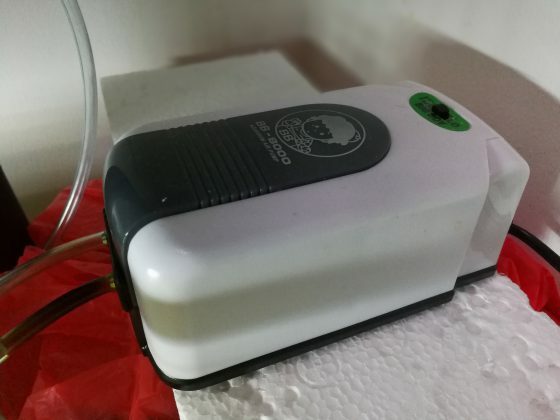 Air pumps for fish tanks do come in many shapes and sizes, but they all have one or more air outlets where you connect your air tubings to. Then at the other end of the air tubing is where you connect your air releasing items, such as the air stones. Important to note that this end of the air tubing is the part that you submerge into your fish tank, NOT the air pump! So in a nutshell, when the power is turned on, the motor or solenoids will cause movements on the strips either mechanically or through magnetic fields. These strips are connected to the rubber diaphragms. When these strips are moved quickly in a repetitive fashion, the rubber diaphragms were stretched and released, causing air to be sucked into them and then pumped into the air outlet. Simple, isn’t it? 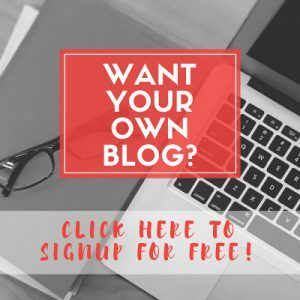 You can even make one for yourself! Now that you know how it works, let’s see why you will need an air pump for your fish tank. Air operated filters such as the sponge filter, corner filter, and the under gravel filter need the air pump to be operational. The air is pumped to these filters through the air tubing and the air bubbles created would draw water from the tank into these filters and trap those physical wastes and debris. 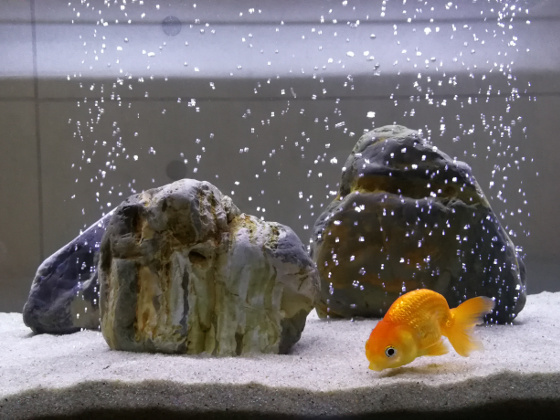 For more on filters for your goldfish tank, head over to this link. In spite of popular belief, the air bubbles in the fish tank do not provide oxygen directly to your fish tank. What happens though is that these air bubbles from the air pump would move up to the surface and cause a lot of water movement. This water movement and agitation encourage a better exchange of gases at the surface. Oxygen from the atmosphere would get dissolved into the fish tank water and gases such as carbon dioxide and nitrogen from the water would be released. Reason #3: The bubbles are just so pretty! Look at this and tell me it is not pretty! Yeah, the 3rd reason is definitely on the aesthetic side. Having air bubbles in the tank not only enhances your visual experience, they also provide another avenue for your goldfish to entertain themselves. I swear I have seen my goldfish “playing” around with the curtain of air bubbles in the picture above. Anyway, you can connect air stones, air tubes or even air operated decorations to the air pump via the tubing to get the effect. All air pumps for fish tanks have only 1 purpose i.e. to pump air. The more expensive ones tend to have multiple air outlets and speed control. If you have a small tank (less than 20 gallons) and you set up your air pump either above or just beside your fish tank, you can go for any air pump with any capacity. However, if you are setting your air pump far away or below your fish tank; or you have a bigger tank, you should go for one with higher capacity than your tank’s volume. Oh…and if you have your air pump set up below the tank, make sure you have a check valve connected. This is to prevent the water backflow into the air tubing, then to your air pump in case of power failure. Anyhow, I think it will be prudent to get a higher capacity air pump as it is more flexible. I mean you do not have to worry about getting a new one when you upgrade your tank, and these air pumps have speed control to cater for slower or faster air flow. That’s it. Air pumps for fish tanks are definitely one of the most basic equipment in fish keeping. Besides being very common, they tend to be cheap too. In my opinion, I think air pump is a must-have in our fish keeping. Besides being used to power our air operated filters, the air bubbles produced increase gas exchanges between the atmosphere and the fish tank too. We all know how gas exchanges are important in goldfish keeping, right? Finally, having air bubbles does make the fish tank looks greater too. So, do you have an air pump for your fish tank? Do you think it is a necessity for all fish keepers? My first pet was a gold fish. This article brings back a lot of memories. Do note that an air pump doesn’t replace a tank filter. Also be careful of over oxygenating the water with an air pump. This is common, especially in smaller tanks. You are right! Air pump definitely does not replace a filter, and we must always have a filter in our fish tank. The air pump is used to operate some filters though, such as the sponge and corner filters. As for over-oxygenating the water, I am not sure that this will happen and that it will be harmful. What I know is if you have a planted tank, over-aerating the water may not be a good thing as it will remove the carbon dioxide that the plants need at a higher rate. This site is the first of its kind that I have seen, I used to own a goldfish long ago and we didn’t have an air pump, I wonder if that is the reason Goldie died prematurely. I appreciate the information you have provided, you rock! Thanks for your comment. There are many reasons your goldfish died prematurely. I think the topmost one is the water condition. For more information on why your goldfish died, head over to this article. nice job and very useful and helpful information. Thanks. I am glad it helps. Air exchanges happen all the time between the atmosphere and your fish tank. However, the rate of this is low when the water is more stagnant. So having an air pump creating those air bubbles which provide water movement will definitely accelerate the air exchanges. So this is only one factor in fish keeping. There are many more that we need to consider and this article will give you a better idea. I think air pumps are an important component to a healthy fish tank. It’s all about finding the right type for your environment and thanks for laying out all this information. This has given me more insight on air pumps. Thanks Vince! Glad this article is able to help in getting more insight on air pumps.